The wind picked up, the sky turned a deep indigo and a few moments later the clouds burst. The rain fell fast and furious, pelting the thin metal roof under which we were sheltering. I was grateful to the Thai monks for their tradition of welcoming travelers. Tonight we would have a safe, dry place to rest. We would not be swatting mosquitoes as we bailed water from a flooded tent. Local women would offer us a fine meal of hot coconut curry and a sticky rice sweet for desert. We would not be rationing out the last of our food reserves on a windswept Andean pass. 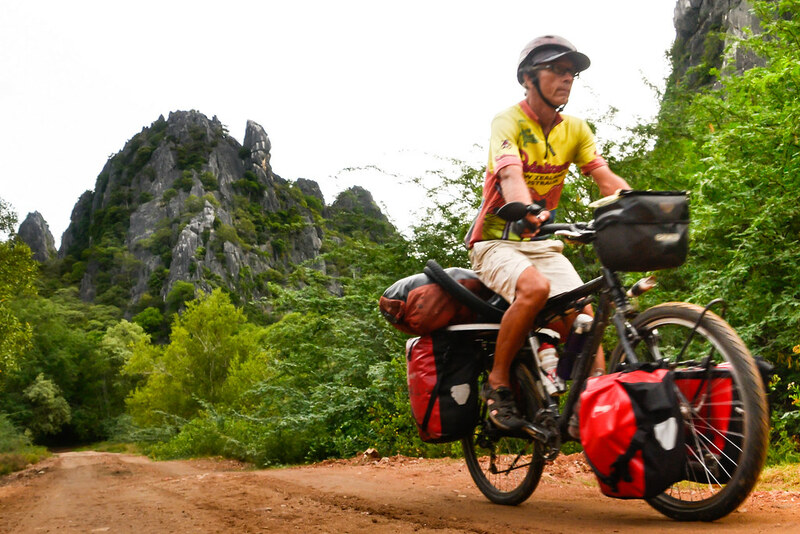 It’s the rainy season in Thailand and we’re attempting to out-pedal storms on a daily basis. Luckily shelter is never far off and we’ve managed to stay fairly dry. Well before dawn, we would be woken by the temple gong and the monks’ melodic chanting. In the calm and cool of daybreak we would pedal off on a silky smooth road following a narrow canal. For a few blissful hours, the roads would belong to us. We would not suffer heaving our bikes through the deep sand of the Sahara or bounce around on the backroads of some developing country. (Not to say those experiences aren’t pleasurable). By noon, the searing sun would be almost unbearable. It would be time for a dip in the sea and a quick snooze on the beach. 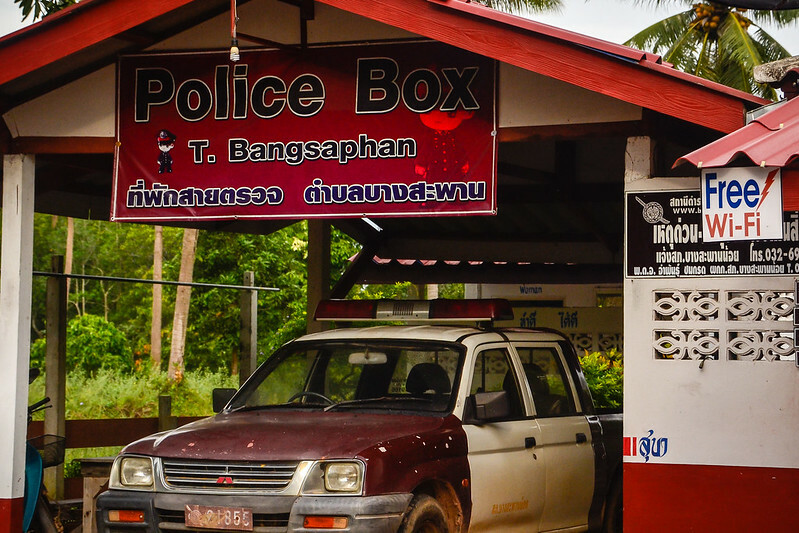 Or perhaps we’d just slip into one of Thailand’s tourist-friendly and ultra-air-conditioned police-boxes and while away a few hours on the free Wi-Fi. There would be no need to push on in the burning heat. Not need to search for our next water source or meal or safe place to sleep. 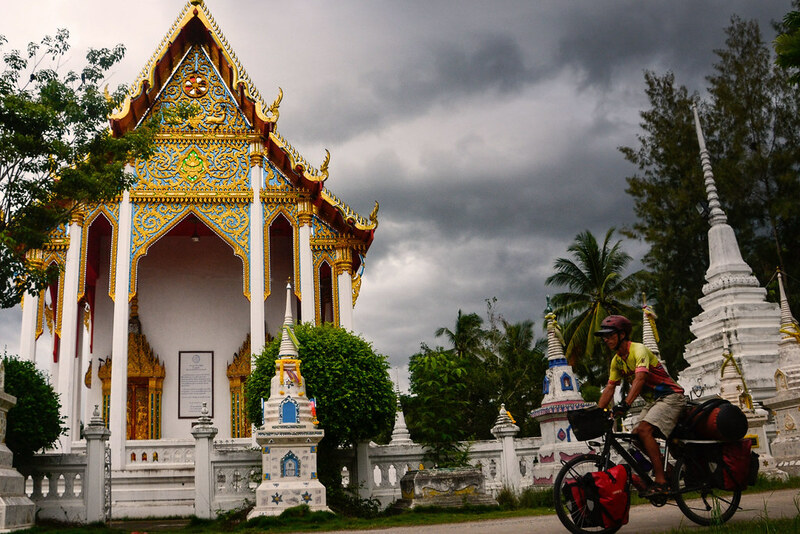 We were in Thailand: the easiest place on earth to go bicycle touring. 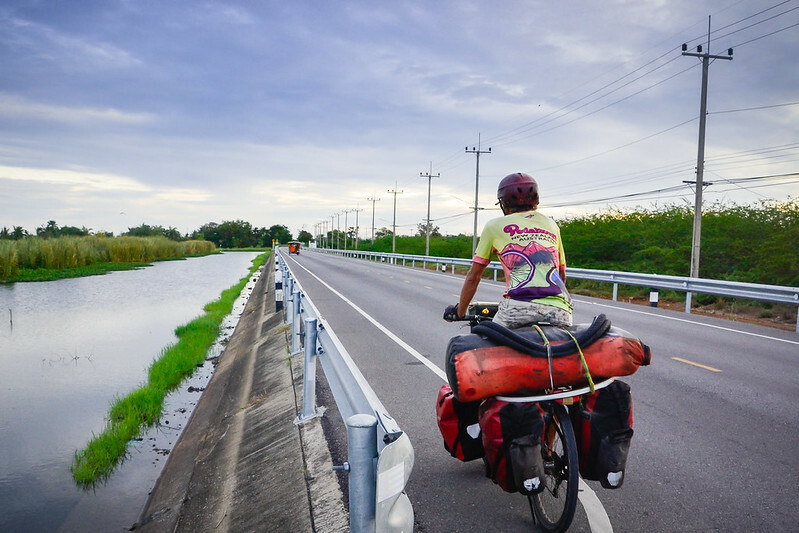 It’s astonishing the number of high quality paved roads the exist in Thailand. I’m not sure how my own country’s road network would fare in a direct comparison. Thai police have moved up to top place in my book! Any force that offers free WiFi, coffee, cookies, sandwiches and clean toilet facilities can’t be all that bad. Far more useful than the rare tourist info centers. 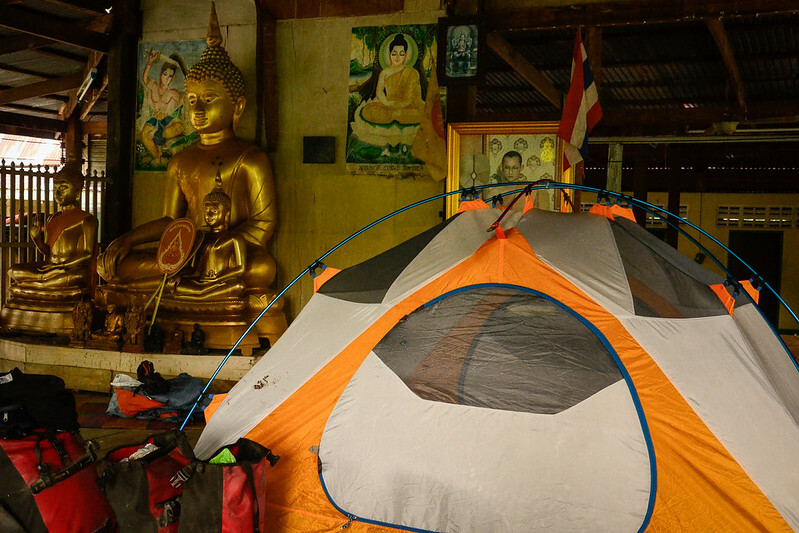 Cycle tourists are not the only ones known to regularly camp out at Thai temples. At least half the time, we camp right along Thai people. Most appear to be itinerant vendors selling their wares around the country. 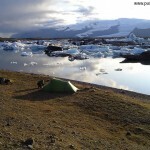 Some come really prepared–electic fans, rice cookers and woks are standard camping gear. Of course we’re the only ones that arrive by bicycle. 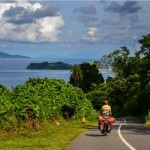 Most locals usually arrive by pick-up truck, others on over-loaded motorcycles. I love a good adventure. 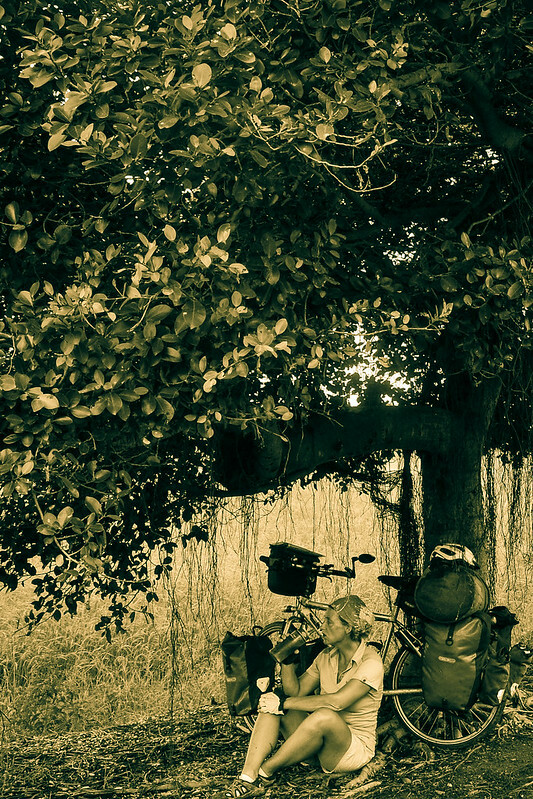 Reading Getting Nowhere’s account of cycling Nepal’s Anapurna circuit got my heart racing. I wanted to do that! Challenge myself. Test my limits. Find out if my middle-aged lungs are still up to a high-altitude climb. But there’s something to be said for taking it easy once in awhile. It took us along time really take to heart that basic truth. 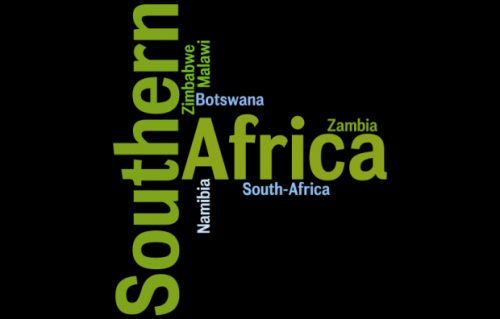 We rather rushed through Africa, bent on making it to Cape Town. We raced through South America, wanting to pedal triumphantly all the way to Ushuaia. Over the years, thankfully, we’ve gotten better at finding the right balance between relaxed riding and tough touring. That said, the situation had gotten somehow skewed recently. The highlands of the Philippines were often grueling. Indonesia was also pretty taxing at times. It seemed there was little time for dawdling. There were always more hills to conquer and another island to dash across. The food was often lousy, the traffic horrendous at times and all the attention we garnered really very draining. Touring in Thailand, on the other hand, is like being let out of school for summer vacation. Days in the saddle are care-free and undemanding. Roads are relatively flat, temple stays are hassle-free (if you don’t mind the 4 AM wake-up call) and Thai food is fabulous (which I’m sure you already know). The equivalent of $1 will get you a tasty plate of noodles or some stir-fried veggies and rice. 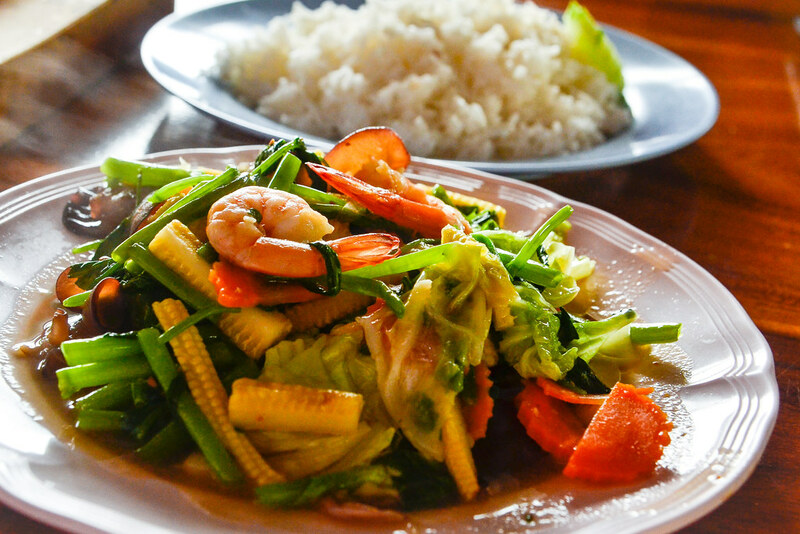 For around 100 Baht (about $3) you can treat yourself to a delicious seafood coconut curry and some lemongrass soup. 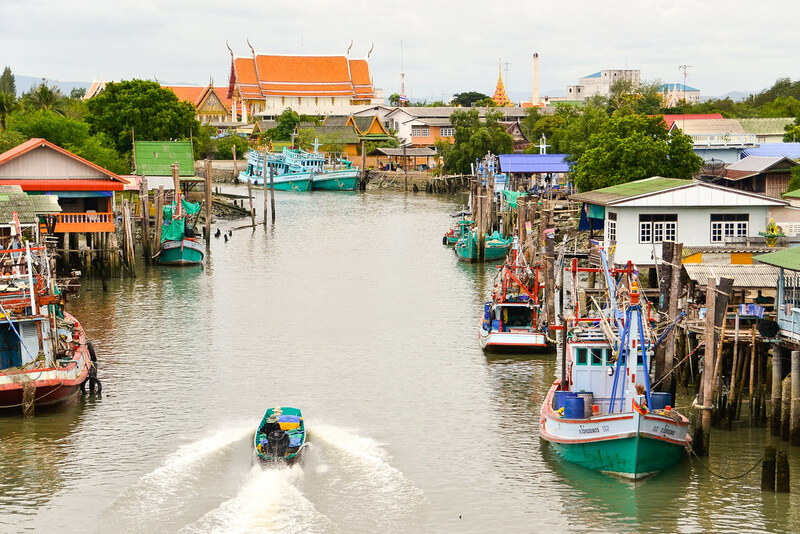 Even the tiniest Thai town boasts a market chock-full of food stalls. The grills are always going, making markets a carnivore’s heaven. Vegetarians can dig into spring rolls and tofu concoctions. Iced coffee and banana shakes are perennial favorites and I always go for the fried bananas. For an extra-special treat, we indulge in the coconut-mango desert topped. Of course the easy life isn’t fulfilling forever. Sloth is only satisfying for so long. The Laos border lies just 400 kilometers to the north. We’ve got a few more days of the easy life and then it’ll be back to what we ultimately love: sweat and suffering. 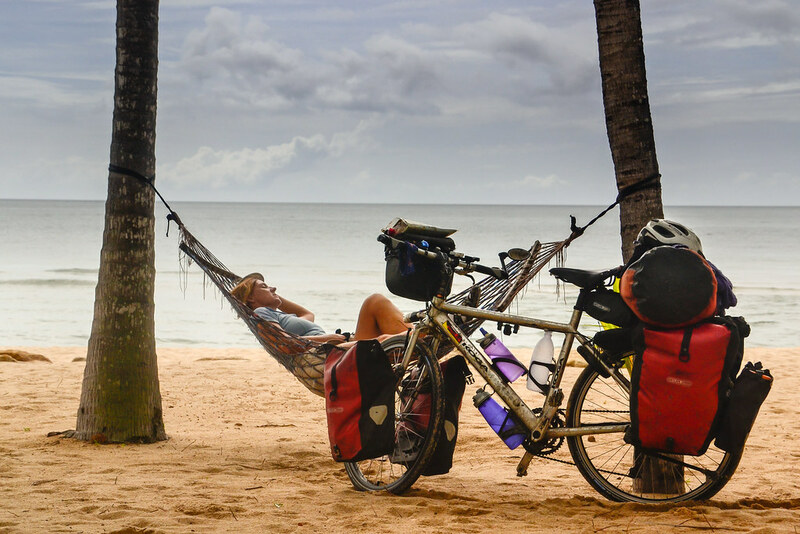 The ultimate way to relax after cranking out your first 50 kilometers! This was lunch at a little hole-in-the-wall place. Around $2 for seafood and stir-fried veggies–sure beats the instant noodles we were surviving on this time last year in Japan. 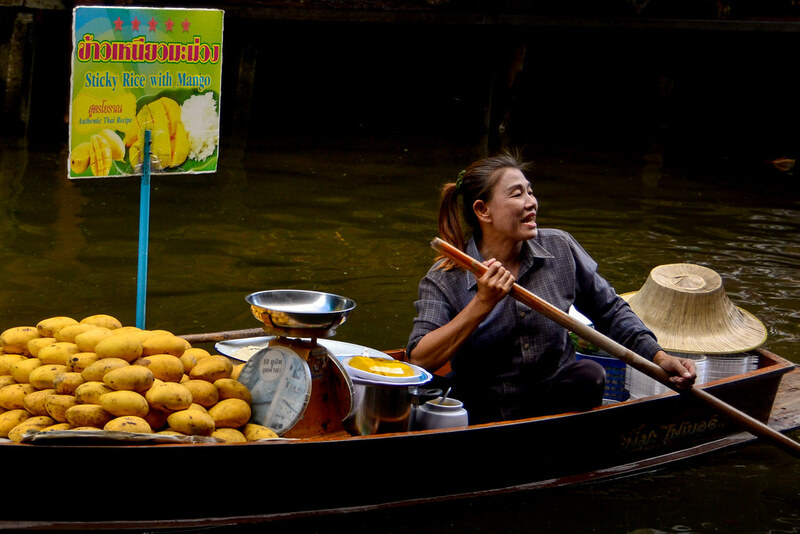 Ok, a visit to a floating market is just about the most touristy thing you can do in Thailand apart from going on an elephant ride. We hadn’t actually planned on a visit, but when we saw a big sign with a giant red arrow announcing FLOATING MARKET 2 Kilometers, we swerved and made the short detour. It was wonderful, so colorful and lively! Now I’m wondering if maybe we should even go for the elephant ride. 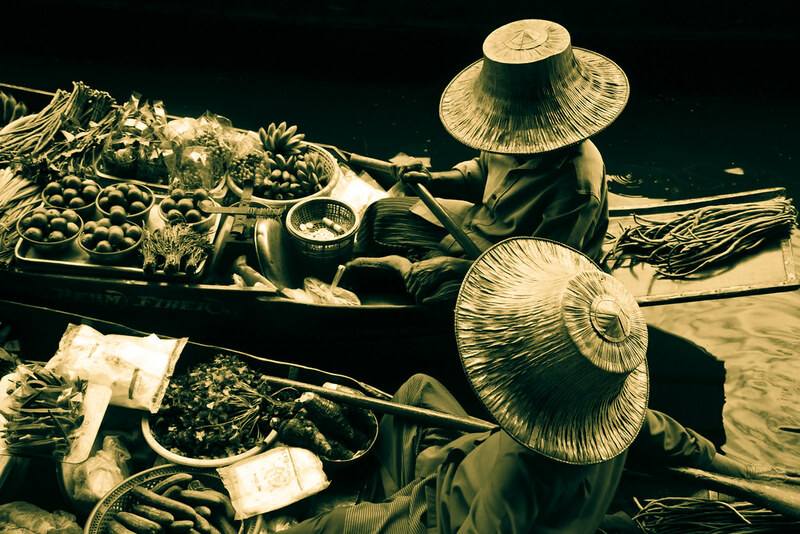 Despite the popular belief that floating markets exist solely to part tourists from their money, we found many ‘authentic’ transactions taking place. I’m not ALWAYS resting, but this was a great spot in the middle of some muddy tracks running through a string of fish farms where we got slightly lost. We use the GPS a lot in Thailand, but this time we ever so slightly regretted following its advice. Just a typical Thai fishing village. We pass dozens of blinged-out temples like this every day. Most of our time in Thailand was spent on good paved roads, but we did wander off on to a few dirt tracks. 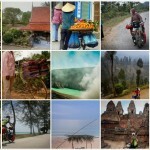 I reckon Laos will be a lot more like this! Nice shirt Eric. 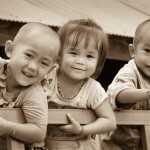 You’ll love Laos. Keep up the good work. The jersey is a hand-me-down from a Warmshowers host in Sydney–he’s got a strictly NZ one that’s waiting in line to be worn when his current favorite is fully threadbare (I’m estimating another 9-12 months).